- Chancery Saigon Hotel is an all suite international hotel, conveniently located in the heart of the business, shopping and entertainment center of Ho Chi Minh City. 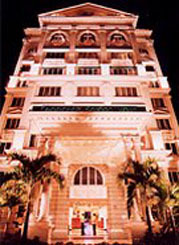 Many historical attractions in the city are within walking distance. Chancery Saigon Hotel is centrally located in Nguyen Thi Minh Khai Street, opposite the Tao Dan park and Reunification Palace. - Chancery Saigon's 96 suites offer guests privacy, space and a quiet sanctuary from the city's hustle and bustle.